in 2 Minutes, W/ or W/O Oil, Every Kernal Pops*, endorsed by Orville Redenbacher! PowerPop(r) microwave multi-popper is endorsed by Orville Redenbacher! Three quarts of delicious popcorn can be popped in as little as 2 minutes. Pop with oil for a butter flavored treat or without oil for a lighter snack. 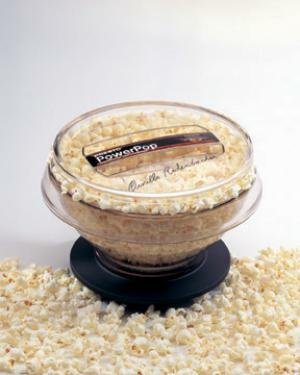 Popper fits in most microwave ovens, even compact models with cavity sizes over 6 inches tall by 10 inches wide. Easy to clean! The bowl and lid are fully immersible and dishwasher safe.